Report: U.S. Official Met With Rebel Venezuelans Who Wanted to Overthrow MaduroNothing ever came of the gatherings, but Venezuela’s hardline leader will likely use them to bolster his anti-American bona fides. American Freed From Venezuelan Prison Meets With Trump in Oval OfficeJoshua Holt’s release may signify a thaw in Caracas-Washington relations. Maduro Wins Second Term in Shattered Venezuela As U.S. Promises New SanctionsThe election was marked by accusations of fraud, and most of the president’s opposition boycotted it. Venezuelan President Caught Sneaking Empanada After Speech to Starving NationPresident Nicolas Maduro might be the only person in Venezuela not losing weight. The Absolute Best Arepas in New YorkThe grilled corn cakes can be filled with almost anything. Trump ‘Won’t Rule Out’ Military Option in … Venezuela?The man is completely stable. U.S. Slaps Venezuela With More Sanctions As Maduro Escalates Power GrabAllies of the Venezuelan president are swiftly cracking down on the opposition. 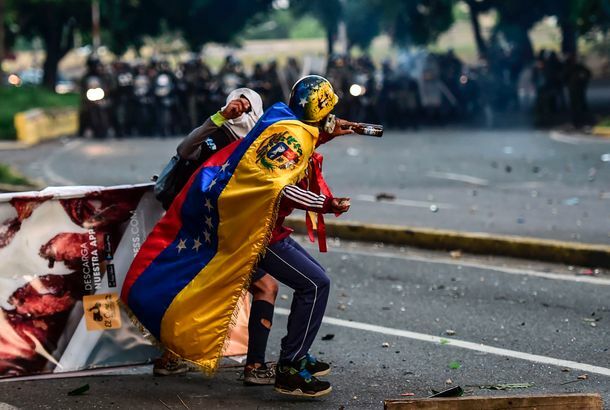 Venezuela Sees More Bloodshed Amid Widely Condemned ElectionMillions boycotted the vote for who will draft a new constitution, which was seen as an attempt by President Nicolás Maduro to consolidate power. Venezuela’s Political Crisis Is Coming to a HeadSunday’s vote to elect a constituent assembly could further undermine the country’s democracy — or unleash large-scale political violence. What the Hell Is Happening in Venezuela?The socialist nation is in free fall. The Times’ Andes bureau chief clues us in on what’s going on and what might come next. 100 Years After the Bolshevik Revolution, Communism Hasn’t ChangedMarxists say they’ve learned their lesson and are ready for another chance. McDonald’s Is Already Having a Pretty Terrible New YearThere’s a new French fry shortage, and someone found at least one human tooth in their food. Edward Snowden Finally Has Some Asylum Offers [Updated]Venezuela, Nicaragua, and Bolivia have all reached out. Hugo Chávez Will Be Buried After AllAs opposed to put on permanent display. Hugo Chávez Will Rest in PublicHis body will be put on permanent display. Hugo Chávez Died of a Heart AttackSecurity chief says he did not go peacefully. Hugo Chávez Is Dead and Fidel Castro Is AliveThe Venezuelan president has lost his long battle with cancer. How Will Hugo Chávez Transport 211 Tons of Gold?Not easily or cheaply! Hugo Chávez Wants to Remain President of Venezuela for ‘Reasons of Love’He’s seeking a third, apparently amorous term. From Cuba, Hugo Chavez Announces He’s Being Treated for CancerHe did not say when he plans to return to Venezuela.